Ever since the Wise Men, there has been a “rule of three” associated with Christmas. Three ships a’sailing in on Christmas Day in the morning. Three ghosts to visit Ebenezer Scrooge. And in my family, the three disasters Christmas Curse. The Curse isn’t in effect every year. Most Christmases for my family are filled with the normal holiday joys and mishaps that accompany large group gatherings. There are heirloom recipes that fail unexpectedly, or disastrous spills of red wine on something white. We forget to take family photos until the day after the big celebration, as people are leaving – exhausted and unshowered. You get the idea. Like most families, mine may be momentarily flummoxed by these occurrences, but we are able (eventually) to take them in stride with good will and humor. Now and then, though, The Curse kicks in and all bets are off. My brother, for example, experienced the Curse as days before Christmas the furnace went out in his house, then a second furnace died in the apartment he rents to an older tenant, then his wife had an accident with the family car. Service and repairman sightings in Chicago the day before Christmas are more rare (and more precious) than sightings of Santa emerging from the fireplace with a bag of goodies. Boom. Best-laid plans for a relaxed family Christmas derailed. I could regale you with stories of the various manifestations of The Christmas Curse over the last fifty years. But I won’t. Suffice it to say, despite these events, we’ve always somehow survived and lived to tell the tales. Usually, with enough distance, we are able to laugh about them. They become part of the cannon of family lore, told and retold as evidence of both the existence of The Curse and our family’s resilience. This year turns out to be a Curse year. The three events happened to my parents, and all three were financially impactful. More heart-rending than the money (and this is saying a lot, because my folks are on a fixed income) was that the Curse necessitated moving the holiday celebration from their home to my sister’s. When you’ve planned every detail of the perfect Christmas, needing to renegotiate every one of those details can be overwhelming. Dad: Listen. The thing to remember is I love you and you love me. Mom: Yes. Let’s cling to that. Then they both erupted into gales of laughter. And that, my friends, is the thing to remember whenever The Christmas Curse strikes: love and good will always carry the day. Fifty-plus years of experience should have taught us that The Curse has an answer in The Christmas Blessing – as the old carol says, “love came down at Christmas”. Regardless of the cares and worries wearing on our hearts, let’s cling to that. Do you ever find yourself wondering about strange things? My mind leads me into flights of odd fancy with a regularity that might frighten others, if they could but spend a few hours eavesdropping on my internal monologue. As I sat to write today’s post, I was thinking about fictional Christmas figures, and began to wonder which character would best represent the Christmas message I need to hear this year. The truth is, I’ve been pretending the holiday isn’t happening. Not out of a bah-humbug spirit – more of a self-preservation instinct as I struggle with homesickness and anxiety about the future. I’m afraid that if I “keep Christmas” I’ll just sink like a stone in a sea of emotion. I am well aware that avoidance and suppression are not healthy coping mechanisms. Luckily, I was raised a reader and a Catholic, so I believe in the power of story and metaphor to change perspectives and help me realign my mental and emotional states. Hence, the creation of a “Christmas Character of the Year” contest in my head. The perennial favorites and the immediate frontrunners for my personal Christmas Character of the Year were, of course, George Bailey (from It’s a Wonderful Life) and Ebenezer Scrooge (from A Christmas Carol). After all, both of these characters, through divine and/or supernatural intervention, experience life-altering paradigm shifts from scarcity thinking to abundance. George, in realizing the wealth of intangibles, like love and respect, present in his well-lived life; Ebenezer in recognizing that his fortune is meaningless if hoarded rather than used for the common good. This year, in particular, I need to maintain mental vigilance to keep my thinking from devolving from scarcity to panic, so it seemed as if these guys would be duking it out in a fantasy cage-match for the title. But. Then I thought of my old pals, Rudolph and Hermey, two misfits from the North Pole who set out to be independent together. Their quest to find a place where they “fit in” turns into a heroes’ journey on which they learn the worth of things like loyalty, courage, steadfastness. They also learn that, while their unique gifts and attributes may not be readily apparent to everyone or in every situation, there will always be a need or use for them eventually. Each of us should nurture and appreciate what makes us US, if we hope to create lives of meaning and purpose. Perfect messages for me, as I struggle to create a new life and home here in the city. The more I thought about it, the more characters presented themselves for consideration. There is Artaban, the 4th wiseman in Van Dyke’s classic The Other Wise Man. Semi-historical figures like St. Nicholas or Good King Wenceslaus. Santa, the jolly old elf, himself. A host of supporting characters: Clarence the Angel, Mary the loving and loyal wife, Bert and Ernie the odd couple of Bedford Falls; Tiny Tim, Bob Cratchit, Scrooge’s nephew Fred; Clarice the doe, King Moonracer, Mama Claus, the Bumble. Many characters bearing messages of striving for right, faithfulness, loyalty, fortitude, love. And then Yukon Cornelius walked through the doors of my memory. He’s a strange figure providing comic relief at moments when the “Rudolph” claymation story became uncomfortably frightening for children. Yukon Cornelius, prospector on a quest for treasure, with his sled dogs and his trusty pick-axe. That strange licking sound he makes before declaring (over and over), “Nuthin’.” He doesn’t find any treasure, but it doesn’t bring him down. Instead, he keeps trying and he adapts. No gold? Ok, he changes his mind and looks for silver. He gets the importance of small things, as evidenced by the quote, “I’m off to get my life sustaining supplies… Corn Meal and Gunpowder and Ham Hocks and Guitar Strings”. He never lets fear get the best of him – he’s resourceful (as when he creates an iceberg in order to escape the Abominable Snowman); he’s brave when his friends need to be rescued; and he keeps his sense of humor (declaring with a chuckle the reason his fall into the ice crevasse was not a fatal one: “Bumbles bounce!”). True, George Bailey is an “Everyman” to whom most of us can relate – the perfect advertisement for the quote “Life is what happens when you’re making other plans.” Ebenezer Scrooge learns that we have a finite amount of time in which to become the person we are meant to be; and he learns that lesson so well as to serve as a cultural icon for personal transformation. But this year, I feel drawn to the humble figure of Yukon Cornelius. Trusty, dependable, even-keeled: there are much worse traits to cultivate in times of emotional upheaval and uncertainty. He fails, but tries again repeatedly. Not a single “Nuthin” causes him to waver. He just puts it out there, again and again, thrusting that pick-axe into the earth. For these reasons, I declare Yukon Cornelius to be my Christmas Character of the Year, 2013. Who is yours? 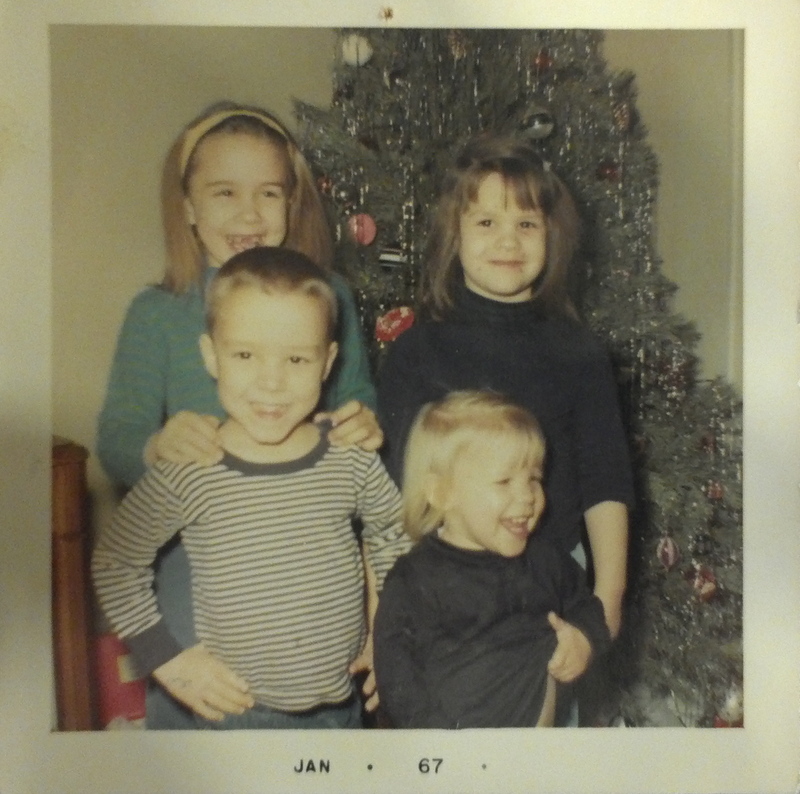 Flashback Friday: Who are these little people? Ben, looking sure of himself and copping an attitude; Nate hanging back a little; Myka smiling sweet as can be; and Timmy looking every inch the scrawny kid with the colt legs – a distance runner in the making. They’re all grown up now. I remember thinking, when they were young, that I needed to cherish that time because they would grow up and lose that specialness that nieces and nephews have in the eyes of their aunts. What was I thinking?! I needed to cherish the time, as adults do with children, because childhood is fleeting. Not because anything would be lost – in either their specialness or my love for them – as they became adults. In fact, they may be some of the best adults I know. Definitely some of the people I most enjoy being with. The "originals", clearly anticipating a fun holiday!